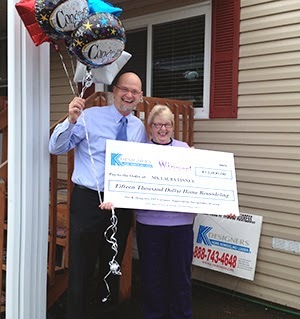 Laura Finney was the winner of K-Designers fantastic $15,000 Home Makeover. She is a previous customer that is very excited about her new makeover of her bathroom! Previously she had beautiful lifetime exterior siding remodel and patio cover projects done giving her a new home at the old address. This makeover consists of the removal of her old tub and walls and replacing it with a wonderful shower with an integrated seat, a slide bar shower wand combination, a beautiful glass door, our brachia diamond patterned wall system and ceiling, plus a new posi-temp valve system and fixtures! We are so excited for you being our $15,000 Home Make Over Winner and that now you’re able to complete the one thing on your wish list you didn’t have.